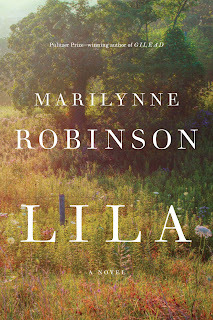 My posts on Marilynne Robinson’s spiritual vision have focused, primarily, on the relationship of human love and divine love in her stories. In other words, I’ve been interested in how nature interacts with grace in the lives of the Ames and Boughton families. More so than Gilead and Home, Lila deals directly with the differences between the natural and supernatural, between the ebb and flow of the physical world and the formulas of organized religion. The book’s title character, John Ames’ young wife (much younger than he), describes her upbringing among a group of migrant laborers after being rescued as a child from destitution by a young woman named Doll. Doll and another woman nurse Lila back to health from the edge of death, and Lila spends most of her young life wandering from place to place with Doll and a handful of unschooled, unchurched outcasts. After a stint in a brothel, the young Lila ends up living in an abandoned shack on the outskirts of Gilead, working odd jobs for townspeople, and eventually marries the old preacher Ames. Lila functions as a kind of “wild child” in Robinson’s narrative—an individual effectively raised by nature, outside of civilized society. She is limited in social graces and linguistic skills, and her reading and writing ability is that of a grade schooler, but she is remarkably intuitive and observant. Language’s ability to reveal and conceal, to express and to obfuscate, lies at the heart of Lila. Reverend Ames, he of the boxes and boxes of sermons, man of public speech, is drawn to Lila because of her remarkable intuition, which he hopes might teach him something of God. Her knowledge of God has not been taught by a church; she has no specialized vocabulary, as he does, for talking about grace, and Ames marvels at the ability of her direct, innocent questions about God to render him mute, to make all of his precise theological language seem suddenly ineffectual. In her youth Lila learned to write by copying down the first chapters of the book of Ezekiel, because she felt drawn to its apocalyptic descriptions of four creatures, like men but with wings and animal faces, of wheels and rings and fire and a “voice from the firmament.” Though Lila can’t identify with the precise theological language of her preacher husband, Ezekiel’s vivid images seem just the right way to depict the “great storms” of existence, as she has experienced them. Ezekiel receives this vision while being called as a prophet. As a sign, God gives Ezekiel a scroll to eat, on which are “written words of lament and mourning and woe” (Ez 2:10), so that Ezekiel literally becomes the word of God. He is sent by God to the rebellious house of Israel, not to those with barbaric ways of speaking, but to the chosen people, those learned in the ways of God’s covenant. Ezekiel, whose physical body has become the word, becomes a sign to those who have been taught the words but are not possessed by its spirit. The parallel here is not hard to find: Lila is an Ezekiel-like figure for her husband. Ames and Boughton are men of letters, scholars of religion, and while Robinson by no means depicts them as pharisaical legalists, their positions as preachers require them to view the world through the language of organized religion. For a good part of the novel, for example, Boughton and Ames debate the teaching on the salvation of the unbaptized, trying to reconcile the harsh-seeming doctrine with their natural inclination to believe in a merciful God. Lila is confounded, and cannot accept that the kind people who raised her (especially Doll) would not be able to saved. Robinson portrays Lila as one who, because of her experience both of suffering but also of receiving mercy from others, intuits the divine naturally, and recognizes the paucity of religious language in ever capturing the reality of divine love. Religious ritual, especially baptism, is depicted throughout the story as rather ridiculous in the face of God’s love, though perhaps necessary for maintaining communities of faith. At the end of the novel, Lila gives birth to in the middle of a snowstorm. Ames lost his first wife and child in childbirth, and has prepared a bowl of water to baptize the baby, should it turn grim again. The child is alive but runtish and silent, and Ames grabs the bowl, which has been set outside and is filled with melting snow, and prepares to baptize his son, just in case. Boughton takes the bowl from Ames’ trembling hands, and in his haste, before he performs the ritual, spills water on the child, who howls in protest. It’s the infant’s first good sign of life, and within moments it’s clear that the baby is good and healthy. All breathe a sigh of relief. But was this accidental christening a baptism? Boughton and Ames discuss the matter, consulting the rubrics in their heads and trying to imagine what John Calvin (whose writing figures prominently in Robinson’s trilogy) would say. They didn’t finish the baptism at the child’s birth, as it was clear that the child would survive. Ames claims that “it was intention that mattered, and that didn’t matter, either, because a newborn child is a pure as the snow,” but Boughton counters that because they didn’t complete the baptism and “act on the intention when circumstance allowed” there was no baptism at all. So they agree to perform another baptism in the church. All of this arguing about religious procedure seems comical—like medieval theologians debating about how many angels fit on the head of the proverbial pin. The rituals and rules come across as fumbling human conventions, not essential to God’s plan. If anything brought life to Lila’s child, it was the spilled snow-water (“better than tap water,” Ames says), not the ritual of baptism. If anything can be said to be “sacramental” in Lila, it is nature and intuition. Though I don’t pretend to know for certain, I imagine that Robinson would call herself a writer first and a religious mind second, and in this sense I understand her portrayal of religious ritual as a kind of comedy bit. A good writer should not want to have recourse to a kind of magic specific to one religion or another; if there is anything that can be called literary “magic,” it is the stuff of metaphor and allegory, of natural symbol and human emotion. The character Lila, because she is unchurched and unschooled, seems closer to this kind of sensibility than her husband, who shares it but whose understanding is bound up in the learned ways of religious ritual and language. Ames, always full of wonder, cites that last line as part of the beauty of God that cannot be understood. Its sentiment—that language is an inadequate vehicle for expression of the supernatural—is also Ezekiel’s, he of the scroll-swallowing, he who becomes the words of God in order to minister to the learned. And this inadequacy of human conventions (language, ritual, etc) is Robinson’s central motif throughout Lila. Religious ritual, just like language, are stumbling attempts by humans to draw closer to the “voice in the firmament” that has “no speech nor language.” Perhaps we would be better off like Lila, who “understood things better when she didn’t try,” and, who someday, will tell her husband “what she knew.” Language and religious formulas, Robinson seems to suggest, are no matches for the pure vision that Lila, like Ezekiel, has within, unable to be expressed in terms we understand. But if human speech is a fall from a kind of purer, more natural language, it is also a necessary one, for it enables community. Before she marries Ames, Lila has never seen her own face—she has never had a mirror--but entering into the community of Gilead means beginning to herself as others do. She forms a kind of identity as she enters into the community of Gilead, growing in self-awareness as she learns how to use language to express sentiments that may not be instinctive but that are crafted out of concern for others' feelings. Shaping your thoughts in terms that others use (for that’s what language is) is both understanding those thoughts and losing something essential about them. For Robinson language seems to be a necessary fall from self-possession, a unavoidable movement outward from a purer, interior awareness, a movement that is both to be mourned and celebrated, for it is both a fall from grace and that which allows connection with others. And I would argue that it’s here, at the intersection of language and identity, where we see Robinson's essentially Protestant artistic vision. She seems to portray her characters as existing firstly as individuals, and secondly, in communion—with others, with nature, and with God. The private world—the world within—is all-consuming in her fiction. It is that which gives her characters their experiences of joy but also that which locks them away from others. This is not necessarily a reality that Robinson seems to celebrate, however. Her characters are always trying to escape their isolation, but seem hopelessly mired in it, achieving only glimpses of transcendence, usually through giving and receiving everyday kindness. We don’t witness much of the life of Lila and Ames’ child in Robinson’s trilogy. Gilead is a letter written to him (his name, after Boughton, is Robbie) and most of Lila anticipates his arrival, but does not report on his life. In Lila he is identified, several times, with his just-cut umbilical cord, a “dark knot” on his belly that marks his separation from his mother. The cut cord brands him as an individual, cast out from that land where, as Ames says during the uncertain baptism, “thou didst form my inward parts: thou didst cover me in my mother’s womb”(Ps 139). Robinson suggests that birth, by its nature, severs the child from a state of grace that is beyond understanding—a place where, as the Psalmist says later in 139, “the darkness is as light.” Cast out of her womb, the child nurses at Lila’s breast, and she can't help but think that “that orphan he was first he always would be, no matter how they loved him.” Like everyone, Robbie is set adrift in the world at his birth, hopefully to love and to be loved, but irrevocably alone. Like Robinson, a Catholic artist would also recognize that we are exiles in this world, possessing only partially our true identities. But I’d argue that the hallmark of Catholic art is to insist that, contrary to the order of principles I ascribed to Robinson, we exist in communion first, and in isolation second. The world within is not an all-consuming one. For a Catholic artist (like Flannery O’Connor) grace therefore acts to jar us, and not always mercifully, out of our isolation, for this world is but a reflection of our real home. For all of my critiquing of her novels, for all of my pointing out where her religious imagination might depart from a Catholic one, I’m in awe of Robinson's ability to craft three novels that grapple with religious ideas so seriously. There is no author writing today who is able to come close to her achievement in this area. In elite academic circles especially, contemporary fiction and religious faith are often thought of as oil and water, but Robinson, herself a professor in the most elite creative writing program in the country, proves that they are not.